From the family archive of Yoshihara Studios, Shibata, Japan. From "Spiral Life". Spiral Life - An archive spanning 130 years. I have met an interesting artist and all around great guy in Shibata City. 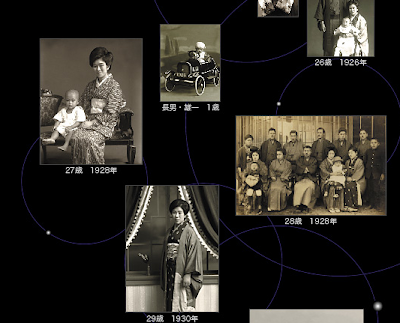 YOSHIHARA YUKIHIRO, is a media artist who has now taken on the massive task of bringing order to the archive of images which his family has accmlulated over the years. This doesn't sound like anything exrtrordinary to the average person like you or me who have a shoebox or two filled with snapshots or maybe a few hundred slides. 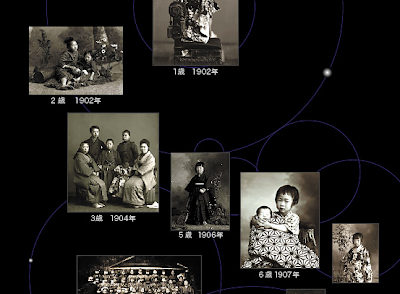 But Yuki is the 6th generation photographer in a family-run photo sutdio that has been in operation since 1870. Thats right, heaps of wet plates, albumin prints and an archive that documents the rural life in a medium sized Japanese town spanning almost 140 years. Unfortunately (or fortunately) I am not working digital while I am here, so I can't show you the portrait I made of him, but this is one he made of me. I felt dumb asking if I could borrow a tripod as I left mine in the hotel. I then prceeded to work in a studio which is older than the part of my family tree which I can trace back with any accuracy. The original darkroom (it is the small brown door behind my head) is even in tact which was used for coating wet-plates 130 years ago. This place is just vibrating with the ghosts of the literally thousands of people who have had a portrait made here, their pictures now, thanks to Yuki, brought into order so as not to be lost. It is the smallest twists of fate that lead you into the places and to the people that help you keep moving along with your work. It is so much more vital when traveling in a very foreign place. Thank you for the hospitality Yuki. That place looks amazing. 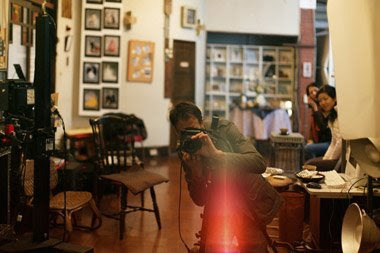 You photographed the interior...darkroom too? I hope. I have to reach out to Yuki as I am doing much the same here. It started with my own family archive and is now moving outward as I acquire other American family's photo archives. Buffet is a collection of special editions, book + print sets, artist's books, print/book trades and various interesting ways in which photographers are packaging and selling their work. Some are sold through galleries and publishers, some by the artists. If you sell your books through the BUFFET, and want to pass something back, any donations are appreciated. The people who support me, thanks!